It’s been a bit of a slow start for us. We had multiple ATV issues pop up within just two days and out survey team got cut short until we could get them repaired. Our team covers approximately 25 miles of beach each night with just a three-volunteer team so our ATVs are crucial to what we do. So far we have seen 13 individuals. Six of those have been new turtles. This means that they have not been encountered and tagged in a previous season. Our recaptured turtles include four turtles originally tagged in 2015. Three of these turtles were tagged by our team (Lisa, Ember, and Sangi) and one was tagged in Melbourne by the tagging team at the University of Central Florida. It’s always fun to exchange turtles! In the last three days we’ve received notification that two turtles tagged by our team were located nesting in Palm Beach County – one that we tagged in in 2017 (Shirleen) and one that we tagged in 2016 (Lillian). Tonight we’re on the hunt for Kailani! We put a transmitter on Kailani approximately 11 days ago. Leatherbacks nest every 9-11 days so our biologists have been waiting for her to return for the last couple days. Finding a leatherback with a transmitter is always a fun process. Her satellite transmitter sends a signal via the ARGOS satellite system that shows us her location throughout the day. This allows us to get in the approximate area where she’s located. Once we’re in the area, we use finer-scale signals from her satellite tag (UHF signal) and her VHF tag. These are essentially “pingers” and we have receivers that pick up their signal. They only transmit when the tag is above the water. So if they transmit for a few seconds and then disappear, it’s safe to assume that the turtle has just surfaced to breathe. However, it they transmit continuously, the turtle is likely on the beach. The receivers are directional so we drive back and forth to pinpoint exactly where she is. We often catch the turtle shortly after she emerges from the water. Even though these tags are designed to stay on long-term, we check them on each nesting event to make sure the attachment is secure. We make sure the safety of the turtle is our number one priority! FLI biologist Chris listening for Kailani’s tag. We’re hopeful that tonight’s the night! We love looking for our transmitter turtles but we’re also ready to continue looking for more turtles! 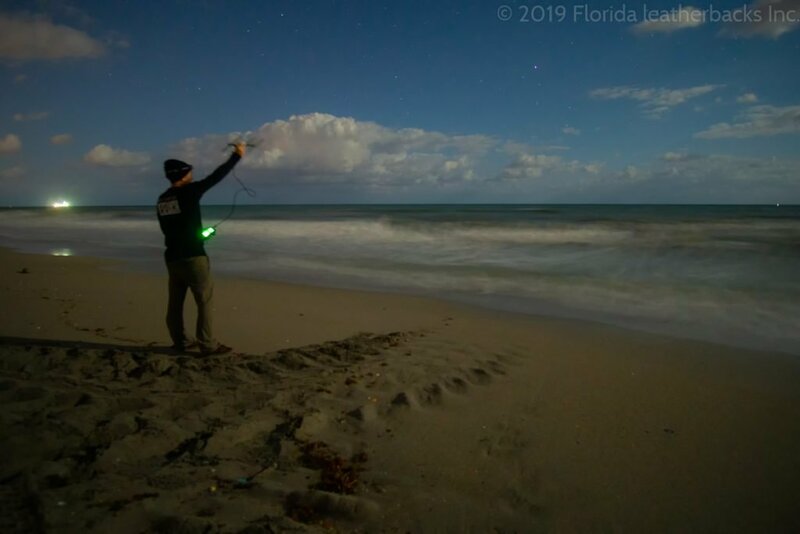 This entry was posted in Uncategorized and tagged blog, florida, florida leatherbacks, jupiter island, kailani, leatherback, leatherback blog, leatherback research, leatherback sea turtle, research, satellite tracking, sea turtle, tracking, trackturtles.com, turtle. Bookmark the permalink.